So this isn't acautlyl going to be a baking post today. Im really sorry but I'm on holiday trying to relax and I havent got any ingredients to make anyhitng. Anyway I wanted to share with you all the bits and bobs that I've had my eye on. These are things that I want to get so I can decorate my cakes really well. I also have some essentials in here. I'll be linking the page to buy them on the picture of it, so if you want to buy it then just click away. 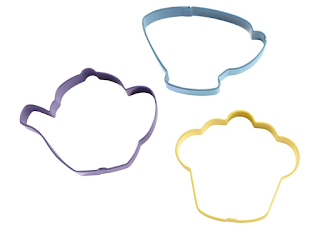 Wilton Three-Piece Tea Party Cookie Cutter Set | This cute little set is £3.69 and I think it would make the most adorable cookies. I also already know exactly how I would decorate the cookies so I need to get these cutters. 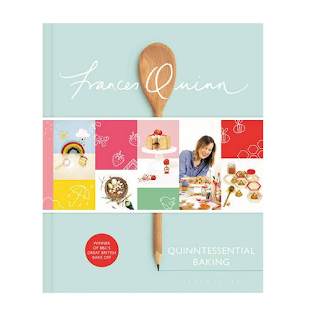 This book looks so good and I just knows its full of cake inspiration for me to work from. This book is £12 and I can't wait to get it. This silicone mould is just what I need. 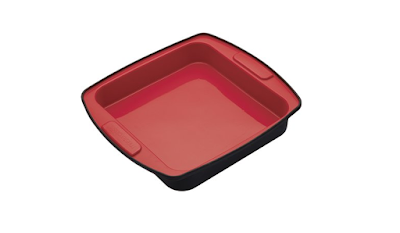 I havent even got a cake tin this shape but this will be perfect for when I bake brownies or make things like rice crispy treats. I find that silicone is so good to bake with. This might not seem very exciting but this is perfect for me. When slicing large cakes through the middle I always end up with one half sloping down. 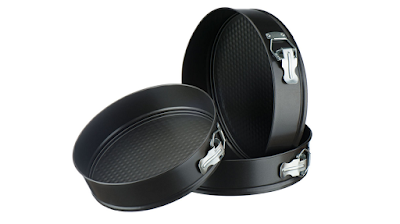 This is great for making sure you get the perfect cut each time. This is £1.53. I want to start making big cakes but I want to go all out on the decoration. 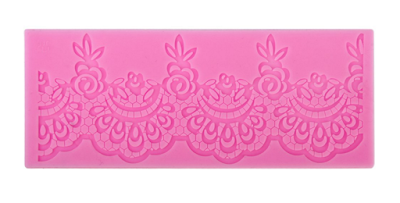 This silicone mould is so beautiful and I really want to get it so I can make somoesn birthday cake look even more special. This is £1.95. 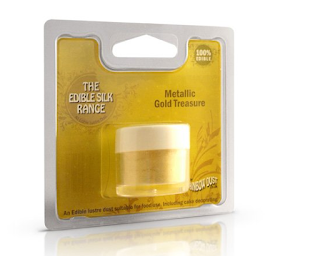 Life is always made better with a little bit of sparkle so I'm looking forward to getting my hands on this lustre dust. I want to get all the colours but I'm going to start my collection with gold and silver. This is £2.35. 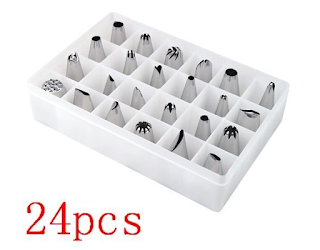 i already have this piping nozzle set but I wanted to include it in my wish list to show you it. 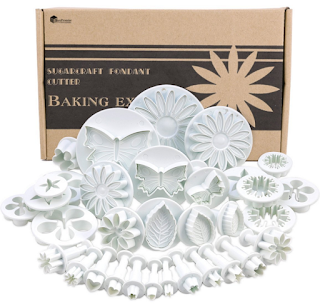 This set is perfect and is great for all you cupcake bakers out there. This is only £5.00. 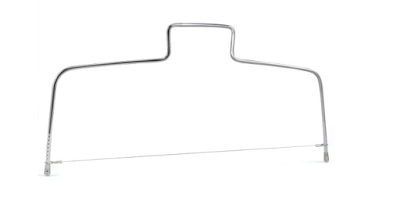 I want to get into making sugar decorations for my cakes so these plungers cutters will be great for making really cute decorations for my bakes. This set is £3.94 reduce from £25.00. 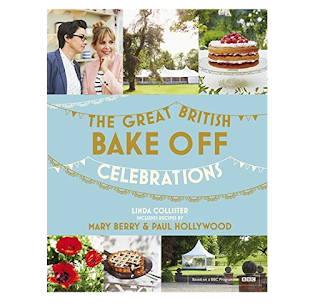 Im a massive Bake off fan but I still havent got any of the books. Im determined to start a little collection so I can create my own showstoppers while using inspiration from the book. This is £8.00. 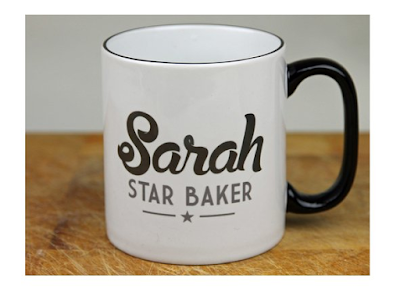 No my name isn't sarah but you can get this mug personalised. I really want it because I can't bake unless I have a mug of tea. Unfornutly I don't want to get it because I can't give myself the title of star baker, it will just look like I'm a bit self obsessed. I mean if anyone want to get it for me then be me guest. I feel like my mum would get it for me but again I don't think I could accept the title of star baker from her. We all know that mums praise you and say you're wonderful no matter how bad you are. Well I hope you liked seeing my little baking wish list. I'll see you friday for a lush review.